To enable better proposals in response to the customer needs our sales people must fulfill, we perform research on optimal mesh cloths, pastes and printing techniques/technology. We will continue to offer a combination of products and technologies to meet a wide variety of customer requirements for print precision, thickness, strength, etc., based on our accumulated wealth of information and experience. In addition to tests for the strength and thickness of mesh cloth, positional changes and the rate of screen elongation caused by repeated printing are evaluated using advanced test and measurement equipment. In this way, our products are checked from various perspectives to ensure the intended level of performance. 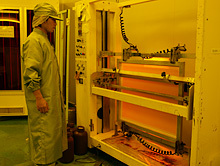 Screen printing is affected by the condition of emulsion and paste as well as the mesh used. 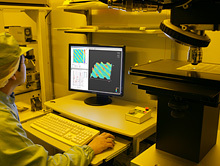 To achieve the optimum combination of print materials for high-precision printing by investigating changes in thickness from the addition of emulsion and the correlation between viscosity and print quality, we are accumulating know-how by building a database of basic emulsion properties, consulting with paste manufacturers and conducting repeated print tests. 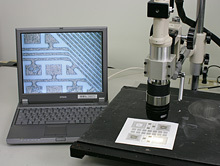 Screen printing methods are varied according to purpose (ranging from high-precision transfer onto electronic components to printing on automotive instrument panels, computer keyboards, posters and vending machines, and magnetic printing for IC cards) in order to support mass production in various industries. One of NBC Meshtec's strengths is the ability to use its research data to offer products that meet customer requirements in areas such as print thickness, screen precision and cost.